Large square tiles can give a contemporary look as they give a continuous feel that is not broken up with many grout lines, beautiful in both gloss or matt and can make your space look bigger. 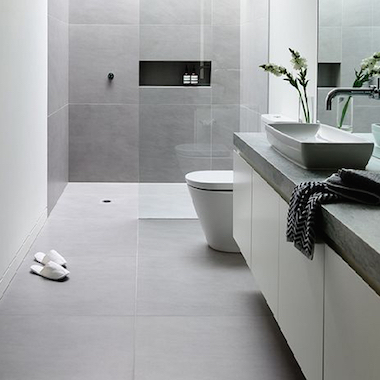 Things to consider when using larger tiles is that you may need to allow some extra wastage/ contingency when you purchase, to allow for cut tiles that can’t be reused and breakages. You will however save a little bit on grouting costs and time. Note that large rectangular tile need to be fixed to flat surfaces so you may need to think about preparing your walls or floors. Tiles have an "industry tolerance" on size variance and be aware that the bigger the tile, the bigger the ‘allowed’ variance. Therefore if you want to use a narrow grout joint, we would recommend selecting ‘rectified’ tiles that are filed down to an exact size and that removes the variance issue.